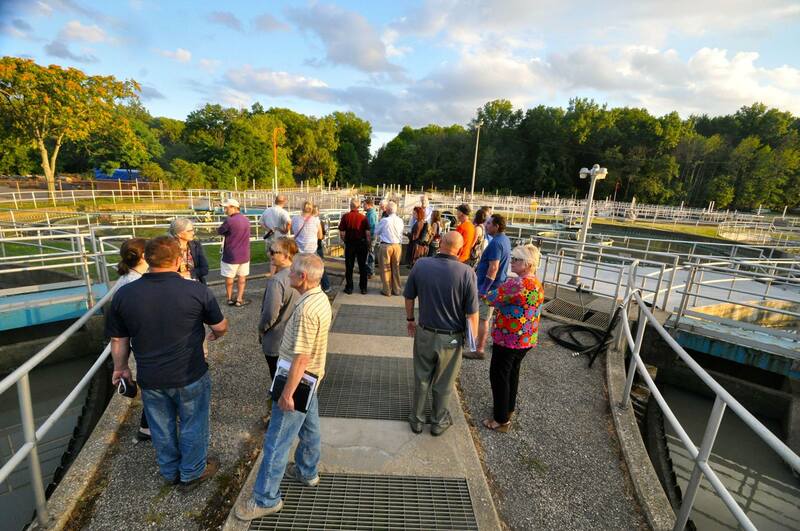 A group of volunteer citizens committed to understanding Lakewood’s water infrastructure in relation to wastewater overflows took a couple of evening field trips this summer. The citizens are members of the city initiative Clean Water Lakewood: Rebuilding the Pipeline for Our Future, who also hosted their kickoff meeting in July. William Crute, division manager of Lakewood’s Waste Water Treatment Plant, and Mirko Kucinic, unit manager, led an Aug. 11 complete tour of the treatment plant, the nearby combined sewer overflows, and the intended high-rate treatment plant coming in the next five to 10 years. The goal of the meeting was to understand how the treatment plant works, and when the facility has difficulty treating all of the water flowing through the sewer system. A couple weeks later, the group toured the Watershed Stewardship Center in Parma. Jennifer Grieser, area manager of Urban Watersheds at the Cleveland Metroparks, led a tour of the green infrastructure installed around the premises to reduce stormwater runoff from impervious surfaces. Additionally, she talked about the maintenance required and pros and cons of the various options during the few years it has been installed at the Center. The next several meetings will take place indoors, where the participants will discuss the issues with clean water entering our sanitary sewers, as well as compare various green and grey infrastructure options and what they see as advantages and disadvantages of each. The city of Lakewood is working on a multi-year, multi-million-dollar plan to continue the city’s progress under the 1972 Clean Water Act. The Ohio EPA approved a permit last year that will enable the city to improve the city’s stormwater management and reduce wastewater overflows into the Rocky River and Lake Erie. For some guidance in the process, the city established a volunteer-driven working group Clean Water Lakewood to help transform water infrastructure in Lakewood. The resident group will focus on facilitating best-practice solutions for wastewater overflows. Lakewood’s combined sewers are designed to take all wastewater to the treatment plant, which can process more than 30 million gallons per day. However, during storms, the volume of rainwater entering the combined sewer system can exceed both the capacity of the combined sewers and the treatment plant. The new agreement includes plans for sewer separation projects and wastewater treatment investments. “No one more than the city of Lakewood desires to do our part to improve the cleanliness of our local watershed, especially our wonderful Lake Erie,” said Lakewood Mayor Michael Summers.